Set in 1999 Los Angeles, veteran police officer Dave Brown, the last of the renegade cops, works to take care of his family, and struggles for his own survival. BEFORE: After taking a day off to move back to Boston for another year of college, the marathon continues today with Rampart. The director, Oren Moverman, and actors Woody Harrelson and Ben Foster, return again for a second film. AFTER: This time Harrelson takes the lead as the police officer Dave Brown and Ben Foster takes a very minor supporting role as the General. Steve Buscemi (who also appeared in The Messenger) and Sigourney Weaver also have minor roles. For many besides Harrelson, the roles were somewhat limiting in terms of screen time but the characters still felt fully developed which is a testament to the actors. As for the story, the premise of investigating a dirty cop’s actions and the impact it has not only on himself, but on the police department and the community of Los Angeles, is very intriguing. Where it falls apart is the inclusion of Brown’s family and his acquaintance, the General. They are integral parts to the film but the execution makes these story lines feel as if they were just tacked-on last minute. 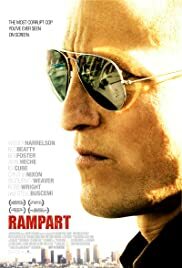 Like The Messenger, I feel Rampart shows a lot of promise and excels in the acting department. Other than that though, the film falls flat.